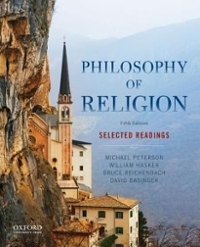 Philosophy of Religion 5 Edition Incorporating twelve new readings, Philosophy of Religion: Selected Readings, Fifth Edition, presents eighty-two selections grouped into fourteen thematic sections, providing instructors with great flexibility in organizing their courses. While it deals primarily with the Western and analytic traditions in philosophy, the book also incorporates readings representing continental, Asian, and Islamic perspectives. The selections are enhanced by substantial section introductions, study questions, suggested readings, and an extensive glossary at the end of the book. The fifth edition includes a new section, "Atheism and Nonreligious Approaches to Religion," featuring work by Paul Draper, Ludwig Feuerbach, Michael Martin, Michael Peterson, and Michael Ruse. Seven other additional selections appear throughout the text. An excellent stand-alone text for courses in the philosophy of religion, Philosophy of Religion, Fifth Edition, is also a perfect companion to the editors' textbook, Reason and Religious Belief, Fifth Edition (OUP, 2012), as the two books share the same topical organization.Package Philosophy of Religion, Fifth Edition, with Reason and Religious Belief, Fifth Edition, and save your students 20% (package ISBN 978-0-19-935952-3). To order, please contact your Oxford sales representative or call 800.280.0280.